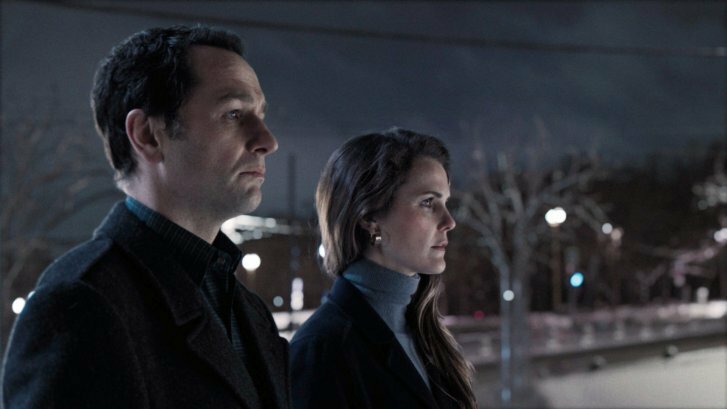 Monday's Emmys will be the TV academy's last chance to honor the FX spy drama which, after being passed over in major categories during its run, is up for four, including drama series and acting nods for Matthew Rhys and Keri Russell, aka Philip and Elizabeth Jennings. NEW YORK (AP) — In the end, after six seasons of murder most foul, high-stakes espionage and international intrigue, it somehow felt perfect that the climactic scene of “The Americans” should happen in the most mundane of places: a parking garage. There was no bloodshed, and not a single bullet fired. “Just four people talking in a parking garage,” says executive producer and co-writer Joel Fields. But that scene, and the much-acclaimed series finale it anchored, was deeply true to the ethos of a show that was never really about action anyway, despite the body count or the sweeping themes at play. It was about a marriage. The show became big by going small. Monday’s Emmys will be the TV academy’s last chance to honor the FX spy drama which, after being passed over in major categories during its run, is up for four, including drama series and acting nods for Matthew Rhys and Keri Russell, aka Philip and Elizabeth Jennings. (It has won two guest acting awards for Margo Martindale.) Avid fans of the series are rooting for the KGB spy couple, who did lots of REALLY bad stuff but were still always the ones you cared about. Is it time for the critically adored but Emmy-ignored series to finally get its due? This for a show whose fan base includes, famously, former President Barack Obama, whose fandom led to a state dinner invitation for Russell and Rhys. Other fans, according to the show, include Canadian Prime Minister Justin Trudeau, U.N. Ambassador Nikki Haley, and the current head of the CIA, Gina Haspel. “For unknown reasons this show flew under the radar for a while, and that was something we scratched our heads about,” says Eric Schrier, president of original programming at FX. But he says the critical response to the show has been gratifying, as have other awards, like AFI and Peabody honors. Not that the premise was ridiculous: It was based on real-life sleeper spies who built lives in the United States, had children, posed as normal families. Though “The Americans” was inspired by the 2010 arrests of 10 Russian sleeper spies in the United States, the show was set in the Reagan era, to more easily convey the tinderbox state of U.S.-Soviet relations. That was 2013. A lot has happened since on the U.S.-Russia front, of course, and more recently, “The Americans” became known as one of the more topical and relevant shows on TV. It was also around then that the writers essentially decided how the show would eventually end (stop reading here if you’re still catching up!) They began a “furious amount of writing” and ended up with a long document — they call it their bible — mapping out each character’s journey. They’re still surprised they were able to stick to it. But there they were, shooting the final season, with the same idea — that when it all came crashing down, and it happened fast, that Philip and Elizabeth didn’t lose their lives or even their freedom, but something breathtakingly profound nonetheless: they lost their children, to the American life they had to flee. Taylor saw the script only a week and a half before shooting. “Like all of us, that final script left me speechless,” she says. Not just the parking garage scene, where they finally faced off with FBI agent (and neighbor!) Stan, or the scene where Paige shocked her parents by getting off that train to Canada, but all of it. Well, not EVERY storyline. Fans still have questions. Was Renee, Stan’s wife, a KGB spy or not? What’s going to happen to poor Henry at boarding school? Will Stan pay for college? (They didn’t exactly get to work out the details.) And will the imminent collapse of the Soviet Union mean an eventual family reunion?